Connecting to a Microsoft SQL Server database isn't too hard, most of the time. But, what if the database is in your office, and you want to access it remotely, but you don't have a VPN? There is another way to connect, using PuTTY and port forwarding. All you need is a server in the office which accepts SSH connections and can connect to the SQL Server. This will serve as a gateway or makeshift proxy server. With the proper port forwarding setup, you can connect to your database from anywhere. The instructions below will work equally well whether you use a password or a key to log into the gateway server. Start PuTTY and enter the hostname and port of your gateway server. This should be the domain name or a public IP address. It's the address of the server you can connect to with SSH, not the address of the SQL server. 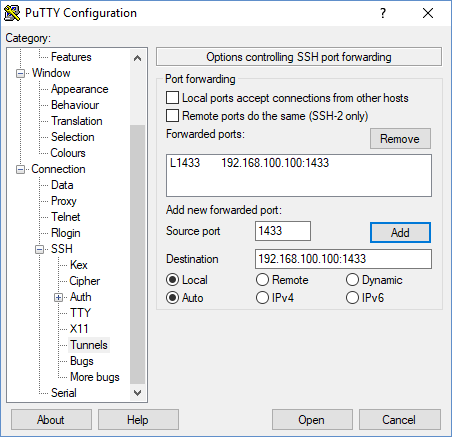 If you are using an SSH key (recommended), you can set it up in the Connection -> SSH -> Auth tab on the PuTTY configuration window. It's also helpful to use Pageant to manage your keys. If you're using a password to connect, you can skip the last step. Now, save your session and try connecting to it, just to make sure the SSH connection works. If you have trouble, your company's network engineer should be able to help. Once that's working, it's time to set up the port forwarding. To do this, we need to set up PuTTY to forward traffic from the local port 1433, through the gateway server, to port 1433 on the database server. You'll need to know the internal IP address of your database server. I.e., the address you would us to connect if you were in the office, usually beginning with 192.168.x.x or 10.x.x.x. Save your session again, then it should be ready to test. Leave your SSH session open for the remaining steps. Now it's time to edit your application's configuration files. Most .NET projects have the connection strings stored in Web.config or App.config, but your application may vary. Set your connection strings to point to the host "127.0.0.1" or "localhost". We're using 127.0.0.1 here, even if we don't have a database server installed on the local machine. As long as the PuTTY SSH connection is open, all traffic to localhost:1433 will be tunneled through the SSH connection and forwarded to the remote database server. Reminder: If you disconnect your PuTTY session, you will lose your database connection. Keep the PuTTY window open, though you can minimize it and you don't need to type anything into it. If you happen to be developing .NET applications on a Windows virtual machine within a Linux or MacOS host, you don't need PuTTY, because you have an easier option. See the sshuttle documentation for instructions on setting up sshuttle. If you're a road warrior or remote worker, and you need to connect to that office database, you can do it even if you don't have a VPN. And, port forwarding in PuTTY isn't just for Linux services. You could set up a similar configuration for Oracle, HBASE, etc. I've even used port forwarding to connect to a Git server in the office.